The downward trend in prices paid for working examples of the rare Apple-1 microcomputer continued last week when the latest example to be sold at auction went for only $330,000, a fall of over $57,000 from the previous Apple-1 sold by Christie’s in July and less than half the record price of $671,400 paid for a similar example in May. The reason for this isn’t clear, as the computer was in excellent condition and included the original box plus monitor, software and peripherals. It may be that the Apple-1 is no longer seen as quite so rare, as this was the fifth to come up for auction in only 18 months. The auction, which was held by Auction Team Breker in Cologne, Germany, also featured an Arithmometer manufactured by Thomas de Colmar in Paris in the 19th century. 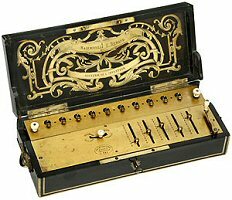 This rare example of the first mass-produced mechanical calculating machine sold for $313,000, a new world record price for an Arithmometer. The date of manufacture was given by the auction house as 1835 but this is almost certainly incorrect, as Thomas did not finalise the design of his machine until 1848 and the presence of a serial number (No. 541) on the front panel suggests that it was one of a later batch of machines manufactured between 1867 and 1870. I’m a huge fan of early Apple computers, having used an Apple II and an Apple Macintosh extensively in the 1980s. However, I always felt that they were overvalued by collectors in comparison to genuine antiques such as the Arithmometer, which are much older and in most cases rarer than early microcomputers, so it’s heartening to see signs that this disparity in prices may be coming to an end. This entry was posted in Computers as Collectibles and tagged Apple, Arithmometer, Auction on 22/11/2013 by Stephen J Marshall. Yes, I created it myself using WordPress. The theme is called Twenty Twelve. As I had never used WordPress before, I bought a book called WordPress: The Missing Manual which gave me the information I needed to create the basic structure of the site.